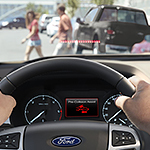 Enjoy greater peace of mind with your Ford vehicle as your driving assistant. Ford continues its history of automotive excellence by integrating the latest safety and convenience technology into its cars beginning in 2019. Ford Co-Pilot360 fulfills a dual function by reducing driver fatigue in repetitive tasks and strengthening safety features. On a long journey, drivers will appreciate a cruise control that monitors surrounding traffic and adjusts speed accordingly to always keep a safe distance from other vehicles. Light sensors inform the vehicle when to raise and lower the high beams so the driver doesn't have to do so. At highway speeds, the Ford Co-Pilot360 monitors the car's place in its lane and warns the driver if it begins to drift. It also senses nearby traffic entering blind spots and warns the driver accordingly. When backing up, a rear-facing camera shows the driver where the vehicle is relative to nearby objects and will brake automatically if it senses an obstruction.